Long holiday weekends usually mean one thing in Southern Indiana: Thunderstorms to wash out outdoor plans. Yesterday was no exception. So, Lady Suzanne and I went to the movies. 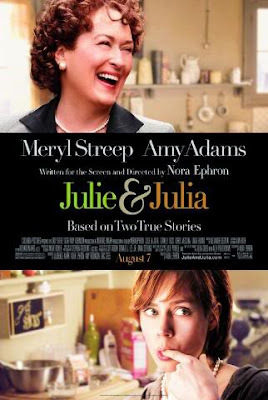 Specifically, we went to whet our cinema appetite with Julie and Julia. It's the story of the famous American-French Chef Julia Child, and a woman named Julie Powell, a government secretary who finds a purpose in life (and fame and fortune) when she spends a year cooking all 524 recipes from Child's book Mastering the Art of French Cooking -- and blogging about it. The movie was a recipe with a lot of ingredients Sir Hook wrote about yesterday: Gaining WISDOM (in this case the Art of French cooking). In fact, this movie might be the quintessential (there's that word we used in England all the time) story of reflection, imitation, and experience. While watching the movie, I wondered how many thousands of people were going to reflect on their own lives, choose to imitate the story, and experience it for themselves. I know of at least one: ME! In keeping with the spirit of the Knights of Moleskine, Spirit, and Ale, I've chosen a slightly different direction: COOKING WITH BEER! Because I don't own a cooking with beer cookbook, I did a quick internet search and tapped into: Beercook.com, a site developed by one Lucy Saunders. About beercook.com's site developer, Lucy Saunders: I write about beer and food, in newspapers, magazines and books, such as COOKING WITH BEER (Time Life Books, 1996). I have a degree in Old & Middle English literature, a certificate in web design, learned baking and pastry at the Cooking and Hospitality Institute of Chicago, apprenticed with pub chefs in London and Brussels, and attended the Siebel Institute. I collect beer glasses & cookbooks, and enjoy sampling new brews. If you have a question about this site or cooking with beer, send me a FAX at 414.247.8681 or write me at lucy@beercook.com . If I do not respond promptly, that means I am traveling, so please be patient! There are nearly 20 professional “beer chefs” featured on the site, as well as a dozen or so home beer chefs. Currently, there are 78 recipes listed. Julie Powell set a deadline of 524 recipes in 365 days and blogged about it. I'm not that aggressive. My challenge is to cook the 78 recipes listed on beercook.com's site (and any more that are added) by the end of the year. That's 116 days (10,022,400 seconds; 167,040 minutes; 2784 hours; 16 weeks rounded down to accomplish this feat (or feast). Bring butter, ale and stock to a simmer in a large saute pan with a lid. Add vegetables, cover and cook approximately 10 minutes or until potatoes are just tender. Add whitefish and cook 2 minutes. Turn the filets over, add shellfish, cover and cook about 3 more minutes, depending on size. Serve in a bowl garnished with lemon wedges and dill. Season to taste with salt and fresh ground pepper. Garlic Aioli, Basil Aioli, Apricot-Dijon Mustard Sauce, Hot Pepper Sauce (Tabasco) or Chipotle Aioli. 78 Plus recipes in 116 day! Follow the blog! Think, Drink, Eat, and Be Merry! Excellent! 2 Thoughts.......First, I expect to be invited to taste your 78 creations when at all possible.....Second, we need to send Lucy an invitation to join our Merry Band! Last night i'd had a pint of McEwens Champion on the go when a pal came round and said he had two AAA passes for the Beth Orton concert in the city... so instead of chugging the whole lot i left about half in the tankard for later..but forgot about it. This morning at 6..as i put together the ingrediants for the stew in the Crock...I found the tankard and thought...oooo that would go well in there with the gravy. So in it went. And so it proved ...i have just tasted the dish and i can't wait to tuck in, by the time you read this..:)) Scrummmmyy!! Last night Lady Gwendoline of Kensington and I sampled Sir Bowie's decisions fare. Sir James even liked the beer battered cauliflower, and we all loved the fried bananas with chocolate - yum!